Shop Peavey Black Widow 1801-8LT Subwoofer Replacement Basket from AMS with 0% Interest Payment Plans and Free Shipping. 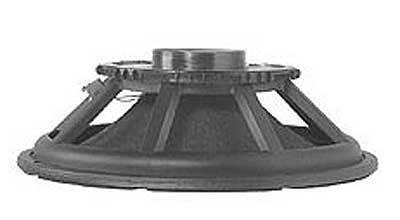 Replacement Basket for Peavey Black Widow 1801-8LT Subwoofer. Only Peavey Speakers are made with the precise tolerances required for field replacement. Field-replacement baskets are a standard feature of Peavey's Low Rider, Black Widow and BWX speakers. It takes as little as five minutes to change out a Peavey designed and approved replacement basket and you are back in business. If you ever get a speaker re-coned from other companies, it can be a rough experience. First you have to find a box and ship the speaker back to the company then wait 6-8 weeks to get it back. And the speaker may never sound the same. Firstly, I give it 4 star instead of 5 due to the fact that the video presented for this speaker is incorrect. I guess the peavey guy didn't want you to know (so you would have to buy another one and another one if you don't know) that you have to clean the magnet circle out before putting in on the replacement basket. If you don't clean it out properly, it's gonna go out all over again. FYI.